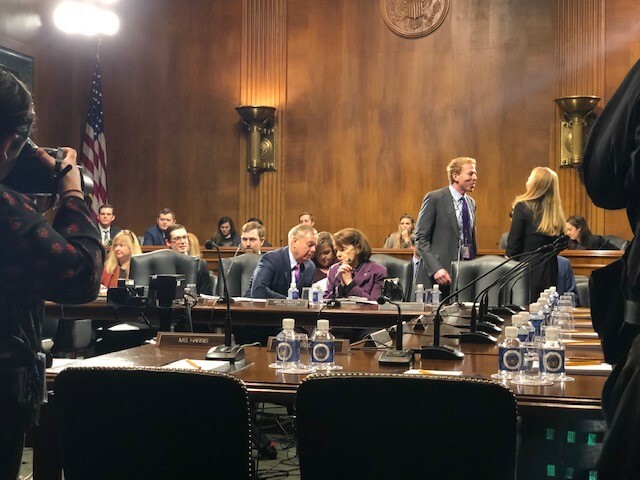 Update 2/13/09: On February 13, the Senate Judiciary Committee held a hearing on the nominations of Michael Park and Joseph Bianco, both to the Second Circuit. These nominees are being advanced over the objections of Senators Schumer and Gillibrand, who have not submitted the customary blue slip. This is one of the many norms in the judicial nomination process the Senate majority is breaking in its quest to push through a record number of nominees. Update 2/7/2019: The Senate Judiciary Committee voted to recommend 42 nominees for lifetime judgeships. With these confirmations, Senate Republicans are continuing their quest to put President Trump’s extremely conservative judges on the federal bench. As we’ve explained, the last Congress confirmed a record-breaking number of Trump’s judicial nominations, and we expect more of the same in this Congress. WATCH: ACS President Caroline Fredrickson talks about the conservative takeover of the courts. On Tuesday, the Senate Judiciary Committee held a confirmation hearing for Neomi Rao to fill the Kavanaugh vacancy on the Court of Appeals for the District of Columbia Circuit. Rao’s nomination has generated controversy because of her record in many areas, including her role at a key federal agency, the Office of Information and Regulatory Affairs (OIRA) within the Office of Management and Budget, where she stalled sexual harassment regulations and has generally pursued a deregulation agenda. Learn more about Rao’s troubling record on regulation. In its Monster Markup on Thursday, the Senate Judiciary Committee will decide whether to recommend for confirmation Trump’s attorney general-nominee William Barr and 42 of his nominees for the federal courts. Stacking hearings and meetings with multiple nominees is one of the procedural tools the Republican leadership is using to break long-standing Senate norms and fast-track the president’s nominees. Learn more about how Republicans have disregarded the usual process for vetting nominees. Once they are confirmed, of course, judges in the federal courts sit for a lifetime. They rule on areas of the law that affect people’s everyday lives: civil rights, criminal justice, education, environment, labor, immigration, health care, and many more issues. For the courts to fulfill their purpose as arbiters of the law, it’s critical that nominees be qualified and impartial. While this week’s judicial nominees are moving quickly through the confirmation process, there’s still time to let your senators know that who sits on the federal bench matters to you. Visit, call, and/or email your senators’ offices to tell them courts matter to you and ask them what they’re doing to ensure the impartiality of the federal judiciary. Host an event on the importance of courts, judicial vacancies, and the confirmation process. In February, ACS sponsors the “Love Our Constitution” initiative, which encourages citizens to hold discussions about the role of the federal judiciary in our lives. Find a curriculum and other resources. Reach out to local radio and television stations in your towns and universities (yes, even you, students!). Speak to your communities about the importance of the courts through reliable and proven avenues of communication. Submit an op-ed or letter to the editor to your local paper on what is at stake with these lifetime appointments. Talk to your friends and family about the need to protect the federal judiciary. Post about the importance of the courts on your social media accounts using #CourtsMatter.